A quick trip around the corner (not this corner, another corner) from the cottage took us to Rasper Punt. 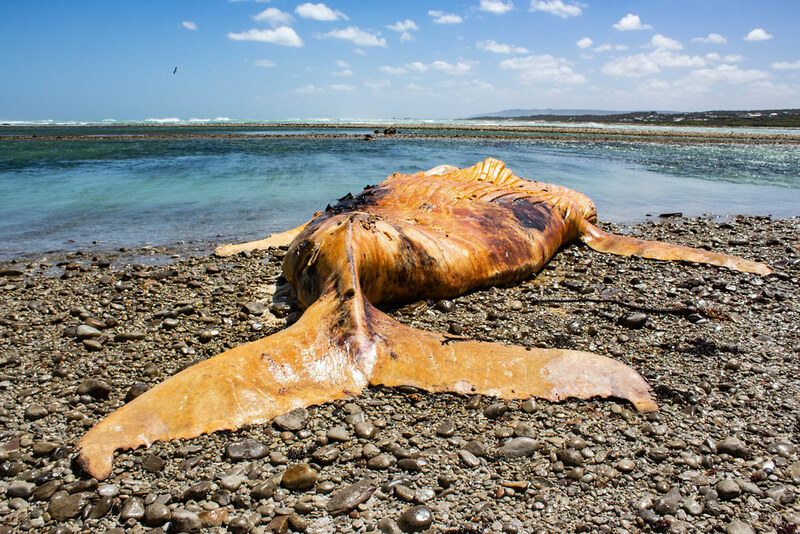 We were there, not just because it’s a nice walk through the fynbos to the beach, but because on that beach was a dead whale. Dead whales might not be to everyone’s tastes (in fact, I’d advise you not to even think about eating one), but they are interesting when you’ve never seen a dead whale up close before. Sad, but educational. And so we went to have a look, take some photos, poke it gingerly and slip all over the whale-oiled rocks. I am not an expert in whaleology, but I think (think) this might be a Humpback. Probably 8-9 metres long, lying on its back, its body attacked by the seagulls and its skin sliced by some humans. And why not? It’s not going to need it anymore, is it? See my link on “Stuff you can make from dead whales” (jks, I never wrote that post, but I know it’s a lot). Having stood on the rocks with the oil leaching from our floppy friend, my feet are so lovely and soft from all the grease on the stones. I’ve never felt so young! Just wait til Tim Noakes hears about this. It was blowing a literal gale while we were down there, so conditions weren’t great for togging stuff, but I got a few which I’ve put onto Flickr already. ‘Hacker’ in this case being a humpback whale and the Norwegian internet being that of the village of Skulsfjord, near Tromsø in northern Norway. Luckily for Hacker, its plight was spotted by wildlife photographer Audun Rikardsen, who was out in his boat searching for new picture opportunities during the polar winter in the Kaldfjorden, a whale-rich fjord near Tromsø in northern Norway. In the morning, they summoned a diver from the fire and rescue team, who went down and investigated. 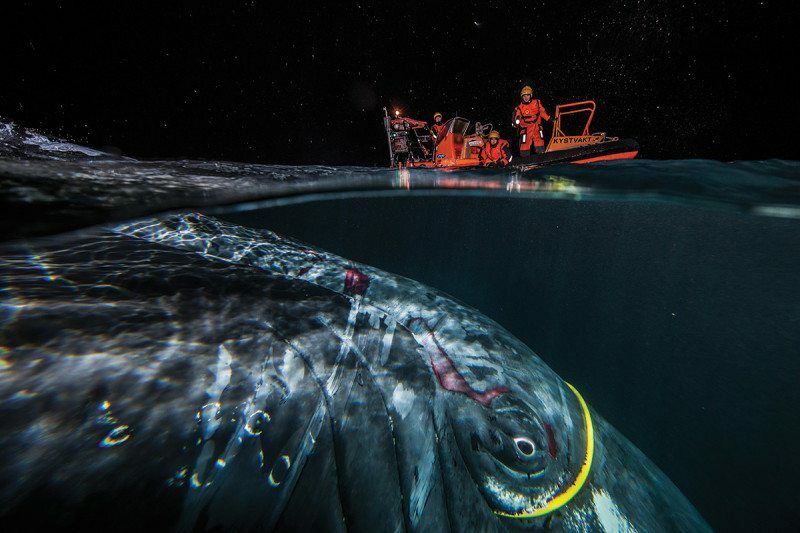 The cord was wrapped round the whale’s head, disappearing into its mouth at the bottom of the picture, before reappearing on the other side, winding round a fin and tangling up the tail. Eventually, after some difficulty, the whale was freed. Only then did the rescuers realise that the cord was a subsea internet cable that should have been 170 metres down on the bed of the fjord. Fjords are deep, hey? That’s over three times the depth of the deepest point in False Bay. And while Audun may have got his picture (and it’s incredible), he then had to wait a while to actually share it, as all communications to Skulsfjord – where he lives – were knocked out for a fortnight by his new-found cetacean chum. Iceland. Land of ice. And volcanoes. And financial ruin (like everywhere else these days). And puffins. They’ve come up with another gem of an idea to attract visitors to their lump of rock: Whale watching – with a twist. You get to eat what you see. Watching and hunting whales “work perfectly together” in a look-and-cook combo of tourism and gastronomy, Iceland’s Whale Commissioner said on Thursday at the global whaling forum. “Many of the tourists that go on whale watching tours go to restaurants afterwards to taste whale meat,” said Tomas Heider, speaking on the sidelines of a meeting of the International Whaling Commission in the British Channel Islands. Many countries in the 89-nation IWC, especially in South America, argue that potential income from tourism far outstrips the value of commercial whaling, and that the two do not mix well. But in Iceland, Heider insists, the industries feed off each other. Of course, we’d never, ever, ever think of doing something so vulgar in South Africa, would we? Unless of course you’ve ever been to Oudtshoorn, the self-proclaimed “Ostrich Capital of the World”, where you can see, feed, ride and then eat the local birdlife. I trust that anyone commenting negatively on the News24 article or writing an angry letter to the IWC (on recycled paper with a recycled pen) will also be contacting Western Cape Tourism and complaining bitterly about these same heinous practices taking place on our own doorstep. Disclosure: 6000 eats ostrich most weeks and has also tasted whale meat on two occasions. He was unimpressed. This from yesterday. Sadly the original online version is hidden behind their silently ever-expanding paywall so I will faithfully and accurately recreate it for you here. It relates to the biggest thing to come out of Cape Town since the Holland v Uruguay World Cup semi-final: that already infamous collision between flying whale and sailing yacht. The question now being asked is whether the whale had been “harassed” by boats before the incident occurred. On behalf of the South African Whale Disentaglement Network (SAWDN), I would warn members of the public not to try to disentangle large whales. I think we have all learnt something there. Many of us routinely try to disentangle whales of all sizes, without even pausing to think about it. I tried to disentangle a couple last week in Kirstenbosch Gardens. And one the week before in the Canal Walk shopping mall. Now I find that I shouldn’t have done it – although Nan Rice doesn’t explain why. There are a couple of other questions I have to ask though. What exactly constitutes a “large whale”. Surely this is elementary tautology? When was the last time you saw a small whale? Even the damn calves are 6m long at birth. That’s not small, unless you’re comparing it with a skyscraper. And when was the last time you saw a whale calf next to a skyscraper for easy comparison? And then who came up with the bright idea of having a whale disentanglement network? Surely that makes them just get more entangled? Why not a whale disentanglement group or society? But no, volunteers (specifically trained personnel, not just members of the public, obviously) arrive on the scene of a “large whale” which is entangled and presumably rather distressed and introduce themselves to the stricken cetacean. 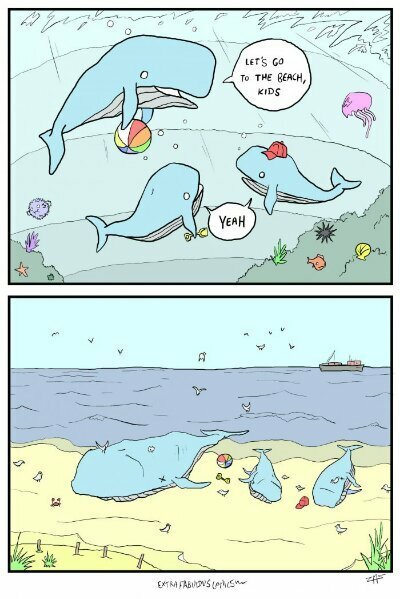 Blah blah blah blah blah whale blah blah blah net blah. With friends like those, who needs enemies? Is it really any wonder they’ve started chucking themselves at our boats? UPDATE: And now there’s video of the allegedly harassed whale doing its thing.